With the release of the iPad 2 in the US (March 11, 2011), and its impending global release (March 25, 2011), I’ve decided to look at the legacy of Apple hand-held hardware. I think the best way for me to examine said legacy of Apple hand-held hardware is to share my personal experiences with the Apple devices that I have had the privilege to own. To add context to this history I think it’s pertinent that I mention that I’ve been an Apple/Mac user since the mid-nineties (circa. 1995/96). I’ll spare everybody the history of the exact Apple computers/devices that I have owned–and still own–over the past years. I will mention that my history with Apple computers began with machines that used the Motorola 68000 line of processors; in 1999 the logical progression of upgrading led me to the PowerPC line of Macintosh computers. Around this same era (circa. 1998/99) I got the Apple Newton MessagePad 120. The MessagePad 120, originally released in 1996, I bought used off Ebay for $180.00. The device was in mint condition. At the time the US Robotics Palm Pilot was all the rage. I had a Windows PC as well, but the Palm Pilot wasn’t a suitable hand-held device candidate for me, as I was using my Mac more than my Windows machine. The MessagePad 120 had an ARM 20Mhz processor that was considered blazingly fast for a hand-held device at that time. It had/has a black and white–calculator quality–LCD display, a stylus for user input, and it had a decent selection of applications. Overall, the device is utterly antiquated in comparison to today’s technology. Notwithstanding the MessagePad’s primitivity, in terms of mobile hand-held computing Apple was well ahead of every other company. Even if we consider the industrial design of the MessagePad 120…it still has a pleasing visual and aesthetic appeal despite being 15 years old. 1. My Minidisc player broke. 2. I had just got a G4 iMac, and the iPod was a nice accessory. In truth, if my minidisc player didn’t fail I probably wouldn’t have bought the iPod. The Minidisc player could only hold 74 minutes of music (about 15-20 songs), and you had to record all of the tracks in realtime to the disc. 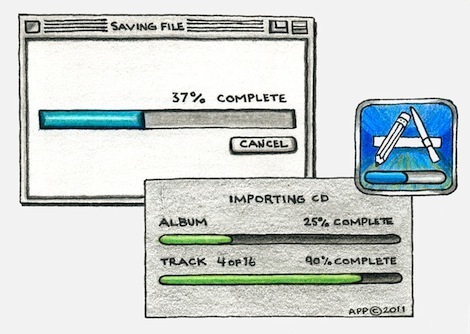 Despite Minidisc’s shortcomings it worked well, however, the iPod’s advantages were clear. I could sync my entire iTunes library to the one device, and subsequently carry all of my music around with me at all times. An additional 6 years would pass before I purchased my next piece of Apple hand-held hardware. In Spring 2009 I got the 2nd generation iPod touch. This was most definitely a exponential leap forward in terms of technology. Besides being an MP3 player the ipod touch could: browse the web through WiFi, run high calibre applications that you would previously only think of running on a desktop/laptop computer, it could play video, and it incorporated an innovative touch screen interface. Looking back on this legacy of Apple devices, I see the iPod touch as being the amalgamation of all of the best features from the MessagePad 120 and the 3rd generation iPod. However, to classify the iPod touch as a mere amalgam of the two aforementioned devices would be a severe understatement, as the iPod touch adds layers of functionality far beyond anything the MessagePad 120 or 3rd generation iPod could come close to accomplishing. The reason why I see the MessagePad 120 and the 3rd generation iPod as the forerunners to the iPod touch should be axiomatic. 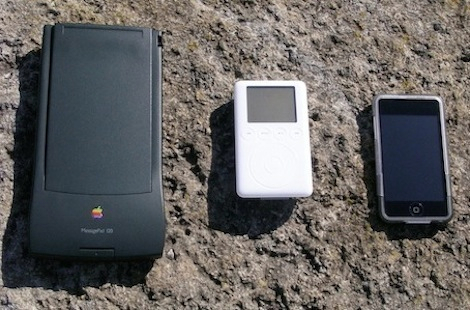 It’s clear that the genesis of the iPod Touch, iPhone, iPad/iPad 2 devices was the Newton MessagePad line of products. While the Newton products were not commercially successful, they did lay the foundation for portable hand-held computers that could rival or potentially replace a desktop/laptop computer. This is interesting when you consider that it has taken 15 years for the industry to reach the point where you can have a hand-held device–iPod touch, iPad, iPad 2, Xoom, Galaxy tablet–that can rival the speed, power, and features of a desktop or laptop computer. Regardless, Apple had the idea and proof of concept for mobile computing with the Newton MessagePad products. Is it any wonder that Apple is currently leading the industry in hand-held/tablet computers? With 15 years of research, development, industrial design, and design aesthetics under its belt, it doesn’t seem that remarkable that the iPod, iPhone, and iPad are commercial success stories.